Awaking at a leisurely hour on Thanksgiving morning – as a couple of empty-nesters with no major feast-preparation and an invitation to join friends for a big family repast that afternoon should be prone to do – after perusing the day’s Washington Post sports page hoo-haw over the latest benching of the Washington NFL team’s fallen prodigy quarterback RGlll, I notice a Metro section front page Obituary teaser on the passing of the legendary Arab singer-actress Sabah (read her obit here: http://www.washingtonpost.com/world/sabah-actress-and-entertainer-who-thrilled-and-scandalized-the-arab-world-dies-at-87/2014/11/26/81ee8b88-7584-11e4-9d9b-86d397daad27_story.html). Instantly the mind drifted back to Randy Weston’s vivid and fairly humorous recounting of his very positive encounter with Sabah for his autobiography “African Rhythms” (2010, Composed by Randy Weston, Arranged by Willard Jenkins for Duke University Press). I quickly emailed Randy (a dedicated email avoider), who was enjoying a few days in his beloved Morocco, via his wife Fatou to give them the news. As I should have suspected, the tireless news junkie was already informed about Sabah’s passing at 87. Sabah’s passing specifically took me back to Chapter 9 of “African Rhythms,” sub-titled Touring The Motherland. That particular chapter is full of great stories on Randy’s triumphant 1967 first tour of Africa, specifically performances in Senegal, Cameroon, Gabon, Ghana, Sierra Leone, Liberia, Mali, Niger, Egypt, Algeria, Tunisia, Morocco and side trips to Beirut, Lebanon and Damascus, Syria. The political climate in Syria in ’67 was volatile (as things change, so they remain the same!) enough to cancel that leg of the tour, but as you are about to read, Beirut was an interesting high point, owed mainly to memories of Randy’s encounter with the flamboyant Sabah. Listening to Randy’s recollections of his encounter with Sabah in Beirut brought back memories of my late Uncle George Weaver, who had been one of the first African American members of a presidential cabinet, serving as Assistant Secretary of Labor under President Kennedy. The first world traveler I ever met, Uncle George would often muse aloud about what a great and swinging city Beirut had been back in the ’50s and ’60s, a veritable Las Vegas of the Middle East. Randy Weston’s Sextet for that very important tour included bassist Bill (aka Vishnu) Wood, drummer Ed Blackwell (who would eventually make the Moroccan migration with Weston), hand drummer Chief Bey, and tenor man Clifford Jordan. In the chapter Randy details his logic for including Chief Bey was inspired by the Dizzy Gillespie/Chano Pozo collaboration and the fact that when encountering African audiences with varying degrees of jazz interest and immersion, he knew Chief Bey’s drums would connect. “That drum is their instrument. They may not be so sure about the origins of the other instruments, but when they see that hand on that drum they know that’s theirs. I would never have gone to Africa any other way,” reasoned Weston in Chapter 9. The drum message of Weston’s music was further broadened by the sixth member of the band, Randy’s teenaged conga playing son Azzedin Weston, who also made the tour. The Sabah experience in Beirut came just after their visit to Algiers. Upon arrival in Algiers they were greeted by this example of eager anticipation in the newspaper El Moujahid: “For the first time since independence we can hear jazz, true jazz for, in spite of what some friends have said, we cannot call Woody Herman‘s music jazz. Tuesday evening, then , at the Ibn Khaldoun Hall, the Randy Weston Sextet will give us our first jazz concert, an event not to be misused by any jazz fan.” Here’s the Chapter 9 excerpt on the encounter with Sabah, in Randy Weston’s own voice. But first, this classic Sabah performance video clip. Beirut, Lebanon was simply extraordinary. First of all it’s a fantastic city. They gave a big party for us and while I’m standing there greeting people this kinda well-built blonde woman came over to me and said “Mr. 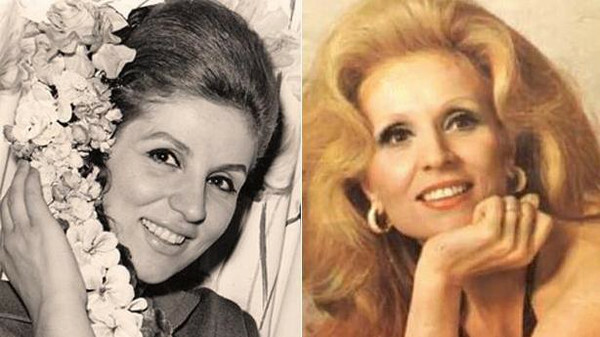 Weston, we’re so happy to have you in Beirut and we really love your music.” She said “my name is Sabah, I’m a singer.” Later on I asked somebody who she was and they said she’s one of the great Arab singers. So when we got ready to leave the party I walked up to her and said I would really like to hear her sing sometime. She said “well, this Saturday we’re having a benefit concert featuring all the great Arab artists; they’re coming to Beirut to play a benefit for orphaned children. Again, another example of our natural responsibilities as musicians; you see this in Africa, you see it everywhere. Sabah arranged to pick me up at my hotel at 8:00. I got dressed real sharp and told Azzedin, who was napping in the bed at the time, “c’mon, get up and go with me so we can experience this night of Arab culture.” He said “no pop, I’m tired and I want to sleep.” I went downstairs and Sabah was standing there waiting, wearing a magnificent caftan, decked out in jewels. We went out to her big chauffer driven limousine, her two sisters were sitting in the back of the limo and they were decked out too. These caftans they had on must have cost thousands of dollars. I’d never seen stuff like this before! The chauffer turned the car around and took off down the street with people bouncing all over the place. He put the pedal to the metal and drove around to the back of the theater in the dark somewhere, parked the car and told her “I’ll be right back, I’m going to find out what’s the best way to get you in this theater.” So we’re sitting in the dark talking and I’m thinking to myself “man, what kinda scene am I in now?” Next thing we know we see two or three guys walking in the shadows, they see our car, recognize Sabah and here come these cats again. The door was slightly open and we were struggling trying to close it, it was like a scene out of a Charlie Chaplin movie. I was tripping out! Finally the chauffer comes running back to the car and we took off down the street. When we eventually got into the theater the Lebanese army was holding the people back on both sides of a red carpet. What kinda scene is this!?! We got outta the car and I’m walking with these three women, one a major star. This scene was like science fiction to me. We got inside the theater and she took me backstage to introduce me to all these great Arab singers, dancers and so forth. When it came time for Saba to go on I noticed her pacing back and forth. I asked “are you alright?” She said “I always get nervous before I perform.” That struck me because sometimes you don’t even know you’re getting nervous, but you’ve gotta go out there like everything is cool. She sang beautifully and you know how those Arab singers are; they hit a note and it takes a half-hour to get to the bottom! She was wonderful! After the concert we all got back in the limo and drove to this nightclub that must have held about 500 people. I walked in with these three ladies and all of a sudden everybody in the nightclub got up and began applauding! The next day I went to her house and hung out with her. This place was opulent, with emeralds in the ashtray and rugs so thick and plush that when you stepped on them its like you’re sinking down into a hole. We had a good laugh when she told me they all wanted to know who this black guy was that she’d been with the night before! Our band played at the American university in Beirut twice. music the “chant profound” of the whole world. than the pale by-products of jazz. I met some Palestinian people and they took me to a Palestinian refugee camp. I saw the suffering of these people, which touched me very deeply. I also met some of the young Palestinian poets and writers and met some composers, including one who had invented a 12-tone piano, a piano on which you could add more notes between the keys to play Arabic music. 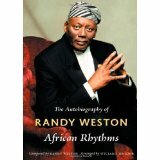 “African Rhythms”, the autobiography of Randy Weston (Composed by Randy Weston, Arranged by Willard Jenkins) was published in 2010 by Duke University Press. This book also has a French edition and will be released in a paperback edition by Duke University Press in early 2015.